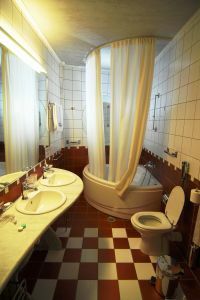 In today’s hectic world, many people choose to take a quick shower in the morning before jaunting off to work for the day while opting for the relaxation of the bath during more tranquil times. Because today’s homes are larger than ever before, many people are finding that they prefer a separate shower and bath tub instead of the more traditional designs that combine both. Doorless shower designs are some of the most popular designs for these separate showers and can even add some sophistication and elegance to the bathroom area. Doorless shower designs are popular for a number of reasons. There is a large amount of design flexibility in creating a separate shower area with thousands of different fixtures, building materials, and sizes to choose from. A doorless shower design means that less overall space is needed for the separate shower area because the homeowner will not have to dedicate additional space for a shower door. Many people choose to use glass or glass blocks for their doorless shower design because of the beauty and design flexibility of a glass shower. With a glass doorless shower design, any fixtures may be used and any accent color that the designer wishes can be added because everything goes with glass. Many people choose to use frosted glass as well to give the appearance of a little more privacy while in the shower. For a glass doorless shower design, the water should be directed towards the structure wall or enclosing wall with the entrance on the side of the shower. This will prevent the water from escaping from the shower. Some people choose to add a raised edge at the bottom of the entrance to ensure that the water will not flow out of the shower from the floor. Ceramic tiles are often chosen for elegant doorless shower designs because of the sophistication of design that can be achieved using the right colors and combinations of tiles. Ceramic tiles can be used to create any design pattern imaginable and are safe to use on all areas of the shower, including the floor and ceiling, making the entire shower easy to clean and maintain. 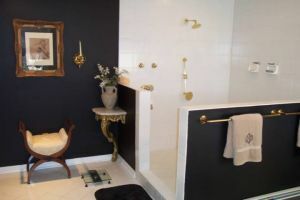 By carefully planning the design of the shower and the placement of the tiles, the designer can create any pattern or picture they wish within the shower area, making it the ultimate unique creation for the home. supply store, and boldly mark out the dimensions of the shower wall that they will be tiling, keeping in mind that one square on the graph paper equals a single tile on the wall. The designer then transfers the picture or pattern that they would like to create onto the graph paper, giving them a tile by tile instruction guide on how the tiles should be placed to create the doorless shower design that they desire. The labyrinth doorless shower design is a design that is quickly gaining in popularity as more people discover the term. A labyrinth design for a doorless shower includes a short, G-shaped walkway to enter into the shower, which is great for a number of reasons. The unique entryway prevents water from escaping from the shower area, prevents drafts and the loss of steam or heat in the shower, and increases the amount of privacy that the person in the shower will enjoy by almost fully enclosing the shower area.